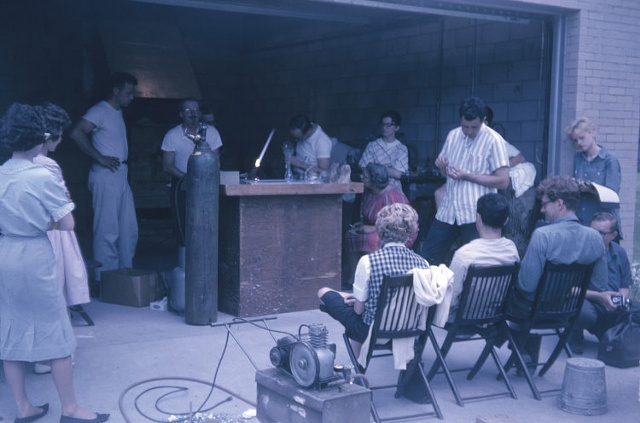 I found these wonderfully exciting images of Mr.Nils Carlson teaching lampworking at Harvey Littleton's 1962 Toledo Glass Workshop. Found in the Robert Florian archive at the Rakow Library of The Corning Museum of glass. At the time of the workshop Nils was a full-time lampworker at The Henry Ford Museum in Dearborn, Michigan. As this year marks the 50th anniversary of the American Studio Glass Movement, birthed out of Littleton's '62 Toledo workshops, many props should also be given to Mr. Carlson, who taught alongside Littleton in the June workshop. Unfortunately, although hundreds of articles have been written about The Toledo Workshops very few accolades or even a mention is given to my man Carlson. It's about time to give this handsome fellow some recognition. I kind of want to hang out with the blonde chick on the right, she seems cool too.